If you can avoid using one, do so, but if you can’t, how do you know what size extension cord for an air compressor is the right size? After all, there are few things aside perhaps from not putting oil in an oil lubed compressor pump, that can damage the compressor than using a too long or too light extension cord. The same can be said of an electric power bar. It might be convenient if the pressure switch does not have an ON/OFF switch to use the ON/OFF on the power bar to cut power to the compressor. That convenience comes at a cost, however. My advice has always been, if you need the compressor at the work site, instead of adding way too small 100′ extension cord to try and feed power to the compressor, leave the compressor plugged into the wall socket, and run a longer air line out to the work place where air is needed. 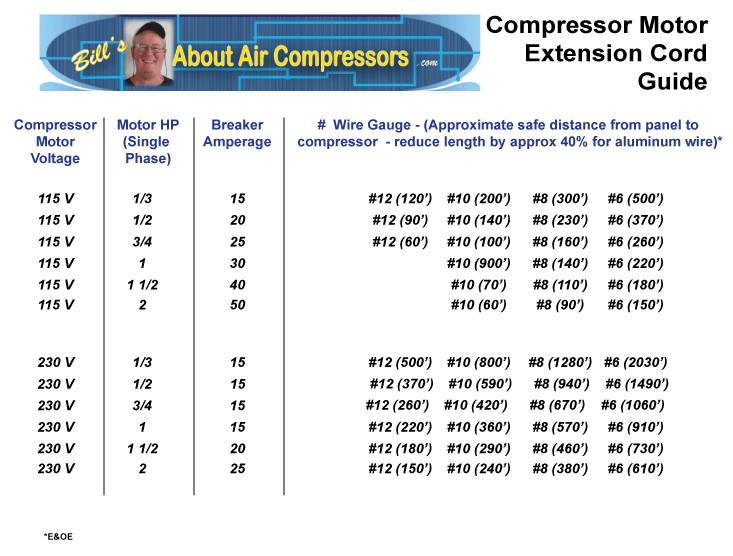 A longer air line will quite likely cost less than buying the appropriate length of heavy duty extension cord and could save your compressor motor from unnecessary maintenance. 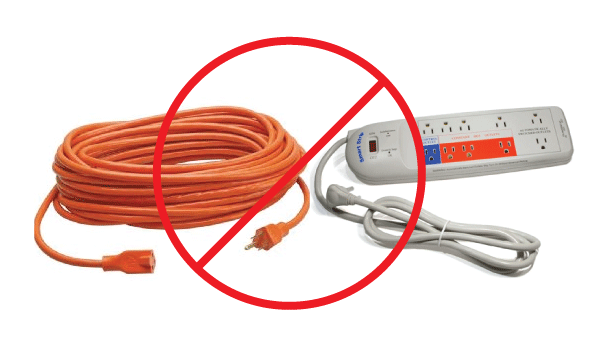 I recommend that you do not use a consumer-type power bar ever. They typically aren’t capable of channeling the power demands of all but the smallest fractional HP air compressor motors need to run properly, without damage due to undercurrent. If you decide that you absolutely must have an extension cord, make sure it’s big enough for the compressor. What follows are only guidelines to help you from disastrously underpowering your compressor motor. You must exercise due diligence to ensure that the extension cord you use will actually adequately power and not damage your compressor motor. …among the many other sources accessed.